Celebrate in style with our Printed Gusset Bags. The G1PL bag measures 2" x 1 7/8" x 9 1/2" and has a purple top and bottom for a splash of color. A clear center provides a stunning presentation for candy, chocolates, small cookies, cosmetics, and more. Side gussets expand when filled. Made with laminated material for additional strength. Add a splash of color to any festive occasion with this printed side gusseted bag with purple top and bottom. Our G1PL printed side gusset measures 2" x 1 7/8" x 9 1/2" and is clear in the center to show off products. 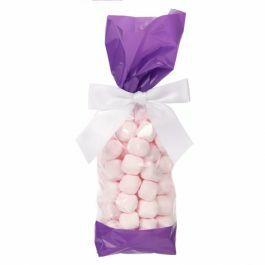 Package wrapped candy, chocolate brittle, toffee, treats, and more. This bag is constructed with extra strength with a sealed bottom and laminated 1.6 mil material. Gussets expand for bulky items and stand upright when filled. This high clarity bag provides an impressive presentation for gifts and favors. Easily close these bags with ribbons, bows, or tin ties. This bag is heat sealable for a more secure closure. Food safe.